The group campaigning to save a disused railway tunnel from abandonment has launched an ePetition to gather support for an alternative vision of reopening it as a cycle path. Closed since the 1950s, campaigners say Queensbury Tunnel’s future is under threat. There are fears Highways England’s Historical Railways Estate (HRE) - which maintains the structure on behalf of the Department for Transport - will insert 20-metre long concrete plugs in both entrances and backfill its ventilation shafts, at a cost of around £3m. 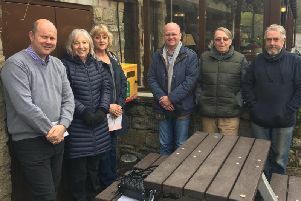 Over the summer, a specialist engineering team visited the tunnel and produced a report on remediation options for the Queensbury Tunnel Society. It found that a repair scheme could be implemented for £2.81 million. The society believes this would transform the tunnel from a liability into an asset, allowing it to repay that investment over time through social, environmental, health and economic benefits. The ultimate aim is for Queensbury Tunnel to form part of a cycle path network linking Bradford, Halifax and Keighley. The society says the tunnel would have to be secured within the next few months as HRE’s works - which are due to start next year - will put it beyond reuse. Norah McWilliam, who leads the Queensbury Tunnel society, said: “We are not seeking any public funds beyond those already committed to the tunnel - we only want them to be spent in a way that isn’t destructive. “Our aim is to save the structure for future reuse, delivering maximum benefit and value for that £3 million. It’s about the legacy we leave for future generations. “We need the Department for Transport to grant a stay of executive - suspending HRE’s work - while stakeholders carry out a full assessment of the tunnel’s great potential and its associated challenges.